In 1898, Smith and Wesson designed a cartridge to hit harder and work better than the 38 Long Colt that the US Military was using previously. This new cartridge was tested over and over again with a 158-grain bullet. It was determined to have more powder capacity which, in turn, provided it with a higher muzzle velocity than the 38 Long Colt round it replaced. They were still using black powder at the time, but later switched over to modern smokeless powder. 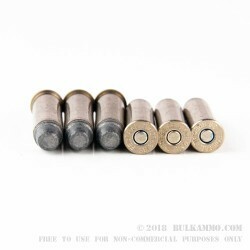 Over the years, many bullets have been designed and used with the 38 Special cartridge. 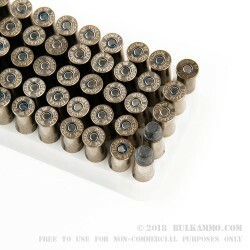 From different kinds of ball ammo for military firearms, to various civilian hunting and self-defense loads, to military tracer ammo that was given to aircrews for the purposes of signaling after their airplanes had gone down, to other "Specialty Loads" that are used for certain "clandestine" purposes. The Smith and Wesson .38 Special loading has had a long and rich history that continues today. 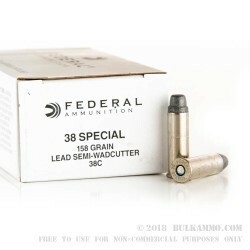 This Federal Law Enforcement .38 Special ammo are loaded up with a heavy duty 158 grain lead semi-wad cutter bullet. They have brand new, reloadable, non-corrosive Boxer primed, thick walled brass cases. These loads run at a subsonic muzzle velocity of 760 feet per second. 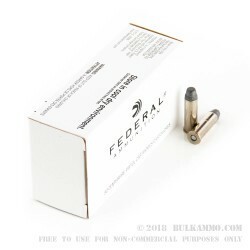 Whether you get this ammo in their individual 50 round boxes, or you buy a case of 1000 rounds, you will have fun with these cartridges. So, get your family and friends together, and head on out the shooting range for the day.